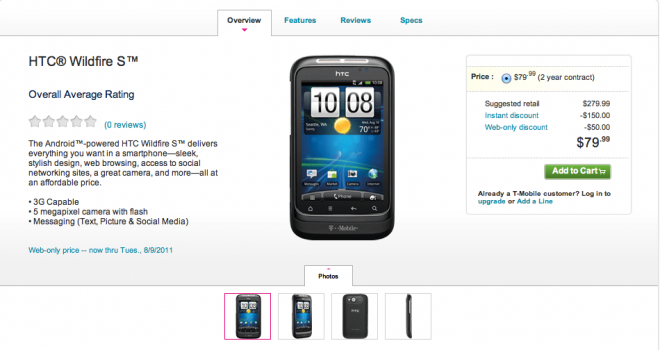 Happy Wednesday morning TmoNews readers and welcome to the wonderful world of the HTC Wildfire S which is now on sale for $79.99 through T-Mobile.com. With a 3.2″ display, Android 2.3 covered by HTC Sense and a 5 megapixel camera with flash the Wildfire S is an affordable introductory smartphone to the Android game. Pick up yours at the T-Mobile link below! ← Deal Alert: Nexus S Free For One Day Only At Best Buy, Upgrades Included! I think this’ll be good enough for those who are not looking for an entertainment phone. It’s more of a “Just need to check my email but still a touchscreen” phone. I think this’ll be my next upgrade. PLUS it is not that big and bulky. I think a 3.2inch screen is cramped for a touchscreen only phone. You have to have the hands of a child to type on a screen that small. I think anything below 3.5 should be a slider. Just use swype and such. It’s even better on a small phone, cuz you can hold it in one hand and move your thumb easily. I tried it on SE xperia X1 3″ screen…. But after I goto Tilt2 then HD2 and now Sensation….I can’t go back to small screen anymore…..or maybe I’m just getting old…need…BIG…LETTERS….to….see…. This would be a good prepaid option. good web === w w w – edhardy007 – c o m ?The best sports shoes store?cheap and high shoes .thank you!! !